U.S. Senator Joseph Biden, one of the Democratic Party Presidential candidates, got a prominent bipartisan support and a strong 75-23 vote in support of his ammendment to the Defense Authorization Bill demanding and promoting a federal system for Iraq. 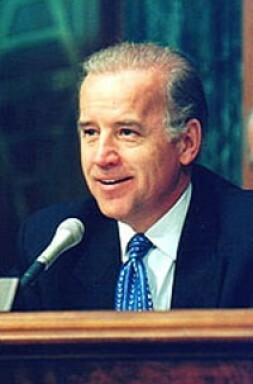 Congratulations to Senator Joseph Biden, one of the Democratic Party Presidential candidates, for his victory in the U.S. Senate on September 26, 2007. A strong 75-23 bipartisan vote supported his amendment to the Defense Authorization Bill demanding and promoting a federal system for Iraq! The energetic Senator from Delaware is the only presidential candidate with a clear and outspoken master plan for Iraq, which now enjoys broad and prominent bipartisan support. There are 17 sponsors, including prominent Republican Senators like former Armed Services Committee Chairman John Warner ( R-VA), Senate Foreign Relations Committee Ranking member Richard Lugar and Senators Arlen Specter ( R-PA), Sam Brownbach (R-KS) and Kay Bailey Hutchison (R-TX) as well as Democratic Senators like former Presidential Candidate John Kerry (D-MI), Barbara Boxer (D-CA), Chuck Schumer (D-NY) or Diane Feinstein (D-CA). Presidential competitor Sen. Hillary Clinton voted in favor of it, while other candidates like Sen. Barak Obama and Sen. John McCaine were unfortunately absent for this important vote. WSN is convinced that the focus on a strong central government in Baghdad, as espoused by the Bush Administration for more than four years, is leading nowhere and is a basic mistake in the war planning. Therefore WSN congratulates Sen. Biden and his 17 sponsors for having opened the door to a realistic and hopefully successful new Iraq strategy.